It's hot, humid and you are 2 hours and 45 minutes into your quarterfinal match on Stowe Stadium's court 3 with the No. 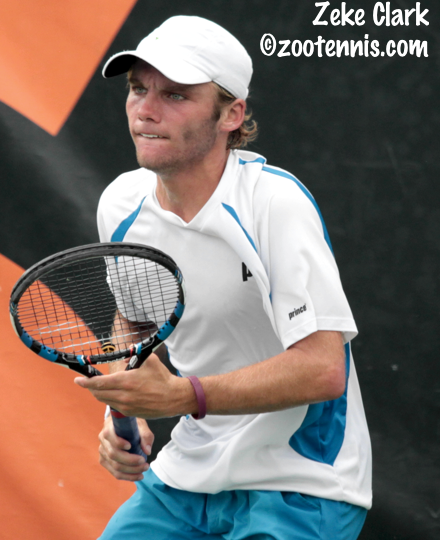 2 seed, John McNally, who beat you 6-2, 6-4 in the semifinals of the Easter Bowl this spring. With McNally preparing for a second serve at 15-30 at 5-6 in the third set, you are given a point penalty for coaching from the stands. Can you keep your emotions in check and prepare for the next point? If you are Vasil Kirkov, you can, with the result a 6-7(1), 6-2, 7-6(2) victory and a place in the semifinals Saturday. "I don't know what he did at 15-30," Kirkov said of his father Stoyan, who frequently clutches a small cross underneath his shirt while watching his son. "I was really confused about what happened. I thought John got a code violation. I wasn't even looking at him, between first and second serve at 6-5 in the third, I'm not going to be looking at my dad for coaching. I have to focus on the return. He (the chair umpire) apologized after, but if I would have lost it would have been a lot different." Kirkov admitted he was agitated by the point penalty, although he did nothing more than briefly question the chair umpire and did not call the referee to the court. "I had to calm down a little bit," said the 17-year-old from Tampa, Florida. "If I was too upset, the match could have easily gone his way, in 30 seconds the match would have been over. So I knew I had to calm down and forget about it, and I think I did a good job with that." Kirkov gathered himself quickly, and although McNally never faced a match point in that game, he did have to withstand three deuces before forcing the third set tiebreaker. After the first set tiebreaker, in which he played some of his worst tennis of the day, Kirkov was ready for another opportunity. "I had put that behind me," said Kirkov of his poor play in that tiebreaker. "I was trying to get off to a good start, get a lot of first serves in and pressure him with returns. I made a few, he made a few errors and I continued doing that." After the Easter Bowl loss, Kirkov knew he had to change his style of play. He got the idea of how best to do that from Sameer Kumar, the Stanford rising sophomore, who beat McNally in two tiebreakers in the final round of qualifying at the Godfrey Futures. "At Easter Bowl, he was just overpowering me," Kirkov said of McNally. "I was hitting everything through the court and he was just hitting winners. I made a big change to try to come in more, try to break his rhythm, because he likes everything in his strike zone. I'm really comfortable at the net, and I don't think he's very comfortable when people come into the net. A few weeks ago Sameer Kumar was doing that every point, and I saw that, so I changed my game for this match. I was pretty happy with the way I executed my game plan." Kirkov also felt he handled the weather conditions better, although he admitted to some fatigue at the start of the third set. "Once I was up a break in the second set, he was going quicker on his service games, and I knew if it went the distance, he would not be as fit," Kirkov said. "I was holding pretty easily, so if I just made him earn it, make him work, it would be close." Kirkov started the final set tiebreaker with an ace, and McNally's forehand produced a couple of errors to give Kirkov a 4-2 lead. A good deep second serve return made it 5-2 and Kirkov then threaded a needle with a forehand pass for four match points. He only needed one, with McNally's backhand return going long. Kirkov will play No. 6 seed Zeke Clark in Saturday's semifinal, who defeated No. 26 seed Timothy Sah 7-6(5), 6-4. There were no breaks in the first set, and just one in the second, but Clark managed to hold every service game of his own. "I got a few lucky holds at the beginning, down 0-40 and 15-40 in my first two service games, so I kind of got away with that, got lucky to weather the storm, because he started really strong," said the 18-year-old from Oklahoma. By the second set, Clark was beginning to get accustomed to Sah's serve, which was more formidable than he had remembered. "I played him at Easter Bowl earlier this year and I was extremely lucky in that one," Clark said of his 5-7, 6-4, 6-4 win in the second round. "I didn't remember him having this big of a serve as he had today. That caught me off guard at the beginning, because he was absolutely dropping bombs. So it took a little while to get used to but towards the middle of the second set and the end of the second, he started to finally miss some first serves, so I started to get some looks. I knew if I kept getting second serve looks, I was putting myself in a much better spot. And that's a good feeling when you're playing someone serving that well." 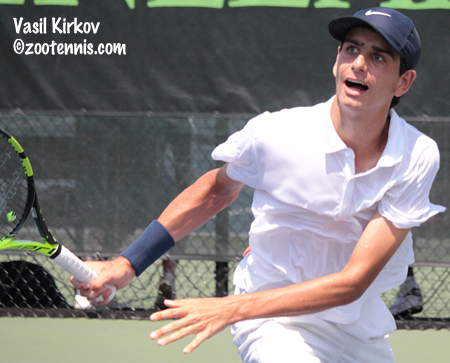 Kirkov defeated Clark 6-1, 6-3 at the ITF Grade 1 Eddie Herr last December, but knows better than to expect a repeat of that. "It's going to be tough," said Kirkov, "He's a competitor, gets a lot of balls back, so it's going to be tough. I'll have to play well." Kirkov was not the only player to use an aggressive strategy to avenge an April loss to a higher seeded player, with No. 8 seed Trent Bryde beating No. 4 seed Sam Riffice 6-4, 6-3. 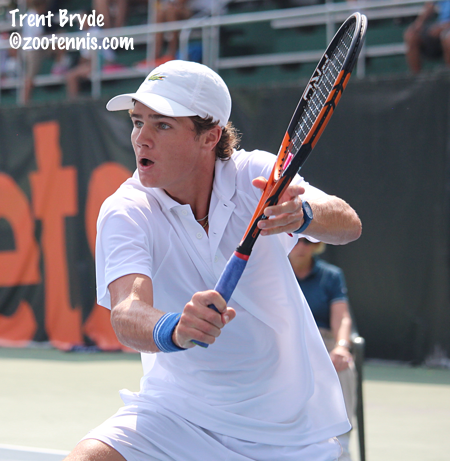 Bryde had lost to Riffice 6-3, 6-1 in the third round of the ITF Grade 1 International Spring Championships in Carson, but it was a loss to Riffice in the Eddie Herr 16s third round back in 2014 that convinced him to play more aggressively. "I've played him so many times, and at Eddie Herr, you probably remember, we had a really good match," Bryde said of that 1-6, 6-3 6-3 loss. "And I played some of my best tennis and I still didn't win. So I knew I had to play my best this time and I did. I played good at key moments. I was up a break a couple of times in the second set and had multiple chances to break him again, but I didn't really think about it too much. I was just swinging." Bryde got the only break of the first set with Riffice serving at 4-5, hitting a perfect lob winner at 30-40 to take the set. The second set was nothing like the first, with four consecutive breaks after Bryde held to open, and Bryde was called for foot faults a vexing number of times. "Every time I started a game I would forget to step back a couple of inches and they'd always call me on the foot fault," said Bryde, who was experiencing a full set of line judges for the first time this week. "It cost me some points and a couple of breaks when he broke back in the second set, and I think it did affect me a lot. But it was mainly just the first couple of points in the game, I kept on forgetting." Bryde was hitting both his forehand and backhand with pace and depth, and moved forward when he could sense Riffice was in a defensive position, but his serve continues to be a work in progress. "Throughout the tournament and actually at BB&T (the ATP event in Atlanta where he lost in the first round of qualifying), I wasn't serving well at all," said the Georgia resident, who turns 17 later this month. "I knew I had to stay on his serve, because I don't know if my serve is going to break down. I'm serving well, but I don't know how long I can keep it up, and when he's going to start returning better. I just had to stay on his serve and I did that in the second set, even though I was getting broken. I got a little lucky at the end, getting the break and closing it out." Serving for the match, Bryde made every first serve, taking something off in order to keep the pressure off his second serve. "I was very aggressive with the kick serves," Bryde said, "instead of going for bombs, when I knew my first serve percentage wasn't great, especially when I was going for it. I didn't play one game really conservative the whole match, so I thought I'd play this game conservative, biggest game of the match clearly. Luckily he gave me a couple of free points by missing returns and I didn't have to work too hard." Bryde didn't hold back on his first match point however, finishing off the love game with a backhand crosscourt winner. 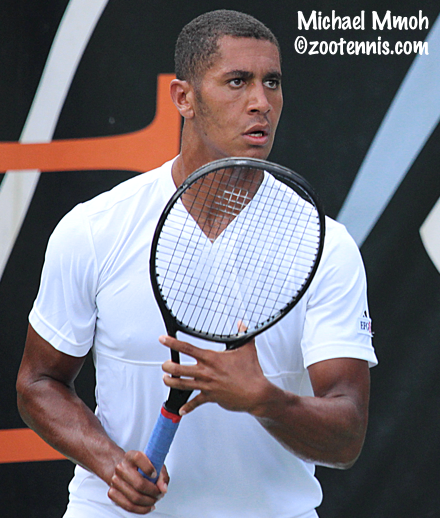 Bryde will face top seed Michael Mmoh, who defeated No. 5 seed Gianni Ross 6-4, 6-2. Bryde and Mmoh have never played. Mmoh got early breaks in each set, and although Ross brought the first set back to 5-4 from 5-2, the effort seemed to drain him. After a long Ross bathroom break after the first set, during which Mmoh moved his chair from the hot sun into the shade behind the court, Ross returned with dry clothes. But, perhaps as a consequence of his illness on Wednesday, he couldn't stay with the bigger, stronger Mmoh. "I was even feeling it," said Mmoh, an 18-year-old from Florida. "Up 5-2, there was a lot of high quality tennis I thought. The points were long and it was kind of stressful, so that's kind of why I let up when I was up 5-2. I regrouped a little bit during that long bathroom break, but for sure he was feeling it in the legs in the second set, 100 percent. You could see he wasn't putting the same amount of effort into his serves, his ground strokes, or even his thinking. He wasn't really playing that smart at the end of the match. I don't know if it had anything to do with yesterday though, because it was definitely really hot." Mmoh was down 15-40 serving for the match at 5-2, but his serve came through, with an ace putting him in the semifinals for the first time after two quarterfinal losses in 2014 and 2015. Mmoh said the US Open wild card awaiting the 18s champion is not something that enters his mind when he's on the court. "The night before that could get me pretty nervous, but once I step on the court, I feel I'm playing pretty well this week, so I'm really confident, so I don't think about the consequences of losing," Mmoh said. "I've been injured for most of the year and have had a rough time coming back, struggled coming back my first tournaments, so I'm happy I'm playing well now." Friday's schedule will feature the 16s quarterfinals and the doubles semifinals in both age divisions. Top seed Lukas Greif will face unseeded Blake Croyder and unseeded Sangeet Sridhar will take on No. 15 seed Robert Maciag at 11 a.m. Jenson Brooksby(10) and Trey Hilderbrand(13) play at 12:30 p.m., with No. 16 seed Keenan Mayo and unseeded Matthew Tsolakyan scheduled for 1:00 p.m.
Greif, Maciag and Hilderbrand will be playing in the doubles semifinals. No. 6 seeds Greif and Drew Baird will play No. 11 seeds Maciag and Jared Pratt and No. 5 seeds Hilderbrand and Jaycer Lyeons will face No. 2 seeds Andrew Ton and Maximilian Wild. The 18s doubles semifinals, scheduled for 2:30 p.m., will have No. 10 seeds Riffice and Anudeep Kodali against No. 4 seeds McNally and JJ Wolf. No. 3 seeds Oliver Crawford and Patrick Kypson will play unseeded Sean Sculley and Nick Stachowiak. For all draws, including the Feed-Ins, see ustaboys.com. The finals are set for the girls 14s in Peachtree City, Georgia, with No. 4 seed Gianni Pielet facing unseeded Sonia Maheshwari. The boys 14s, girls 12s, and boys 12s are all into the semifinal round. The quarterfinals are set for the girls 18s in San Diego.